Height and Form: 10-15 ft x 8-10 ft (2.4-3 m), dense, rounded form, formal "aristocratic" look. 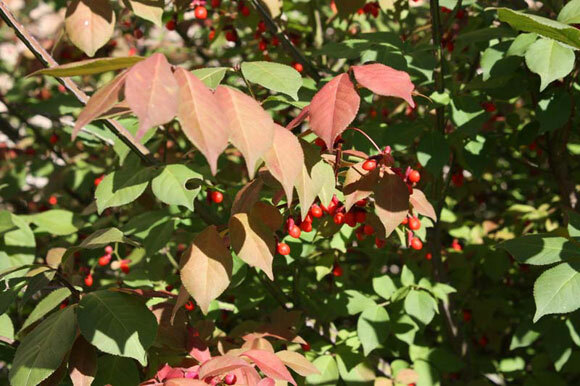 Foliage and Bark: Leaves opposite, 2.5-7.5 cm long, medium to dark green, bright red in fall. Flowers, Fruit and Seeds: Flowers small, 6 mm across, inconspicuous, yellow-green, 4-petaled, perfect (male and female parts in same flower). Fruit reddish-purple, ovoid, 6-8 mm, much of it falls before its leaves drop. Culture: Sun to part shade, very adaptable plant, not particular about soil. Name: alatus: winged, the shoots. Culture: Sun to part shade. Prefers a light, well-drained soil, but tolerant of moisture and most soil types. Easy to grow.